Home » Health A-Z » Do Hair Dyes/Colors Damage Your Hair Permanently? The use of a hair dye to colour the hair has become quite common over the last few decades. Currently, millions including both the genders use it. Although the primary use of hair colouring is to improve hair colour, it is also used to cover up grey hair by both men and women. Hair colouring is believed to give your hair a perfect shine and texture along with making you look younger. In recent times, the usage of hair dyes has increased significantly due to a higher disposable income and growth in fashion-consciousness among men and women alike. While its abundant usage is due to its cosmetic appeal, the fact that it can lead to long term problems should not be ignored. You should also be aware of the permanent damage of the hair caused by the repeated and extensive use of such products. In this article, we will be shedding light on what happens when you dye your hair, the common products used in hair dyes and the side-effects caused by hair colouring. Moreover, one of the common questions that almost everyone using a hair dye has is that does hair colouring damage the hair permanently. Well, read the article to get your query answered. Always Trust For Better Hair Care. Check Our Products For Healthy Hair Now! What Happens When You Dye Your Hair? Colouring of the hair is not only performed by professionals but is also a popular cosmetic procedure done at home. As hair dyes are widely available, it has become easy to colour the hair at the comfort of your home. But there are few things to know about hair dyes and its colouring process. Hair is made up of root and shaft. When you colour the hair, it is the shaft which is coloured and not the root. The shaft is made up of three layers namely cuticle, cortex and medulla. The medulla is a hollow core, cuticle contains tightly packed cells and the cortex is the one that consists of natural colour pigments (these are the pigments which determine the colour of the hair). When you use colouring agents, it either rips off the natural colour from the hair shaft, adds a new colour or does both. 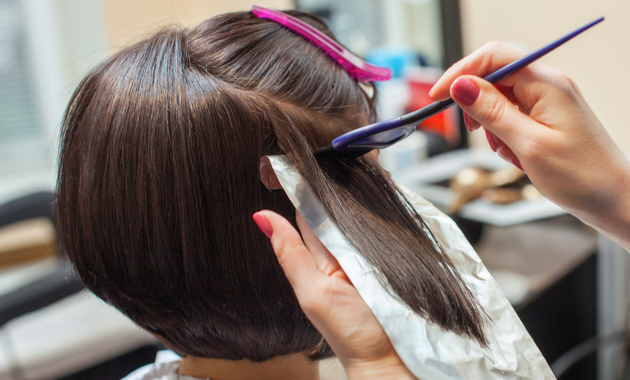 Hair dyes contain a lot of chemicals right from ammonia to peroxides. Basically, there are three types of hair dyes which are temporary, semi-permanent and permanent hair dyes. Temporary Hair Dyes: For permanent colouring of the hair, the product should penetrate the cuticle to so as to either deposit the colour or remove colour in the cortex of the hair. Temporary hair dyes contain large molecules which are too big to penetrate the cuticle. As a result, these dyes only coat the shaft of the hair providing temporary colouring of the hair. It is one of the most common hair colouring alternatives used to get a blonde or golden colour to hair. The use of bleach produces a colouring effect by oxidizing the hair follicles. This not only damages the natural state of the hair but also removes the moisture from the hair follicles. Moreover, it can further lead to dryness, breakage, and split ends, which can cause hair loss. Semi-Permanent Hair Dyes: These type of hair dyes contain small molecules such as aromatic amines, which cause swelling of the hair shaft. This, in turn, causes the dye to penetrate the cuticle and allow it to enter the cortex thus colouring it. The usage of semi-permanent hair dyes is quite popular as they are easy-to-use and do not contain bleach. Moreover, these dyes do not change the natural colour of the hair but merely add a layer of colour that progressively fades over a span of six weeks. They only add a layer without affecting the nutritional profile of the hair follicles. Therefore, they are considered to be safer in comparison to permanent hair dyes and often the first hair care tips when it comes to colour. Permanent Hair Dyes: Contrary to semi-permanent hair dyes, permanent hair dyes change the natural colour of hair by embedding the colour deeply into the hair. They are known as oxidative dyes and contain the smallest molecules of the aromatic amines which cause swelling of the cuticle. The oxidative dye namely hydrogen peroxide allows the dye to penetrate the cortex which removes colour and lightens the hair. These type of dyes cause the hair colour to lasts until the hair grows out. While ammonia was a common ingredient in permanent hair dyes initially, companies have started to offer ammonia-free hair colour options. However, as permanent hair dyes can cause detrimental effects that are heightened by prolonged exposure, caution is highly advised in applying these types of products. You can even consult a dermatologist before picking up any hair dyes or opting for hair colouring treatment. Due to the different types of risks involved in the usage and applications of hair colouring products, it is advised to get colouring done by professionals and avoid prolonged exposure to hair colouring products in addition to following proper hair care tips. So if you are planning to colour your hair at home, then do not forget to look at the pack of the hair dye to know the type of hair colouring agent before you buy one. But if you are getting it done at a salon or parlour, do ask the professional about the hair colouring products before you opt for one. 1. Ishida W, Makino T, Shimizu T. Severe Hair Loss of the Scalp due to a Hair Dye Containing Para phenylenediamine. ISRN Dermatol. 2011;2011:947284. 2. Saitta P, Cook CE, Messina JL, Brancaccio R, Wu BC, Grekin SK, Holland J. Is there a true concern regarding the use of hair dye and malignancy development? : a review of the epidemiological evidence relating personal hair dye use to the risk of malignancy. J Clin Aesthet Dermatol. 2013 Jan;6(1):39-46. 3. Patel D, Narayana S, Krishnaswamy B. Trends in use of hair dye: a cross-sectional study. Int J Trichology. 2013 Jul;5(3):140-3. 4. Gavazzoni Dias MF. Hair cosmetics: an overview. Int J Trichology. 2015 Jan-Mar;7(1):2-15.